The aims of the present study were to provide quantitative data on the impact of air pollution on the health of people living in Tehran city, the most populated city of Iran. The approach proposed by the World Health Organization (WHO) was applied using the AirQ 2.2.3 software developed by the WHO European Centre for Environment and Health, Bilthoven Division. Concentrations of ozone, nitrogen dioxide, sulfur dioxide and particulate matter of aerodynamic diameter ≤ 10 μm (PM10) were used to assess human exposure and health impacts in terms of attributable proportion of the health outcome, annual number of excess cases of mortality for all causes, and cardiovascular and respiratory diseases. The annual average of PM10, SO2, NO2 and O3 in Tehran were 90.58, 89.16, 85 and 68.82 μg/m3, respectively. Considering short-term effects, PM10 had the highest health impact on the 8,700,000 inhabitants of Tehran city, causing an excess of total mortality of 2194 out of 47284 in a year. Sulfur dioxide, nitrogen dioxide and ozone caused about, respectively, 1458, 1050 and 819 excess cases of total mortality. Results indicate that the magnitude of the health impact estimated for the city of Tehran underscores the need for urgent action to reduce the health burden of air pollution. Exposure to air pollution can cause both acute (short-term) and chronic (long-term) health effects. The acute effects of air pollution on human health were amply proven in the 20th century, when severe air pollution in Europe (Meuse Valley and London) and in the United States (Donora, Pa) caused deaths and disease in hundreds of thousands of people [1, 2]. This episode has demonstrated that high concentrations of air pollution lead to an increase in mortality  and morbidity. In later studies, investigators found that levels below even current air pollution guidelines are associated with adverse effects on health [3–13] and air quality standards may not be protective enough for the most sensitive groups . In addition, even though pollution due to combustion fuels has fallen dramatically in recent years, emerging pollutants such as O3 and NOX, and changes in the composition and size distribution of particulate matter, have become important in the health effects of air pollution [3, 15]. The present study assessed the health impact of air quality on the residents of Tehran, the capital city of Iran, the largest urban area of Iran with a population of 8,700,000 in 2011 (Figure 1) . The city also is ranked as one of the largest cities in Western Asia and 19th in the whole world. As in other large cities, Tehran is faced with serious air quality problems. In general, 20% of the total energy of the country is consumed in Tehran. Pollutants such as PM10, SO2, NO2, HC, O3 and CO are the major air pollutants in Tehran, about 80-85% of which is produced by mobile sources of pollution . Map of the study area and locations of monitoring stations (Monitoring S) with valid observations. The city has a capacity for 700,000 registered cars yet 3 million roam its streets on a daily basis. Compounding Tehran’s air pollution problem is its geographical location. With the location of 35° 41' N - 51° 25' E and altitude of 1000–1800 meters above mean sea level, Tehran is located in valleys and is surrounded on the north, northwest, east and southeast by high to medium high (3800–1000 m) mountain ranges. The mountain range stops the flow of the humid wind to the main capital and prevents the polluted air from being carried away from the city. Thus, during winter, the lack of wind and cold air causes the polluted air to be trapped within the city. These concomitant conditions make Tehran as one of the worst areas in the world for atmospheric pollution with many days exceeding air quality standards during each year . Because of the air pollution in the Great Tehran area, morbidity, mortality and symptoms emerge. At the moment, the concentration of these pollutants is higher than the standard level most of the time which means that they have numerous effects on the health of Tehran citizens . Up to now the human health endpoints of air pollution has not been quantified in Tehran. The main aim of this study was the quantification of the short-term health effect of air pollutants for people living in Tehran, by using World Health Organization (WHO) approach. Where AP is the attributable proportion of the health outcome, RR is the relative risk (RR) for a given health outcome, in category “c” of exposure, obtained from the exposure–response functions derived from epidemiological studies and P(c) is the proportion of the population in category “c” of exposure. Where IE is the rate of the health outcome attributable to the exposure and I is the baseline frequency of the health outcome in the population under investigation. Where NE is the number of cases attributed to the exposure and N is the size of the population investigated. RR gives the increase in the probability of the adverse effect associated with a given change in the exposure levels, and comes from time-series studies where day-to-day changes in air pollutants over long periods were related to daily mortality, hospital admissions and other public health indicators. RR values used in the present assessment are shown in Table 1. The RR values used for PM10 were summary estimates derived from a quantitative meta-analysis of peer-reviewed studies focused on European investigations , while for SO2 the RR implemented in the software and proposed as summary estimate in the WHO Air Quality Guidelines for Europe  was used. Finally, for O3 and NO2 the RR values came directly from published studies on short-term effects within the Air Pollution and Health: a European Approach (APHEA) project [21, 22]. The baseline rates of all mortality for the calendar year 2010 were obtained from death certificates recorded at the Civil Registration Office of Tehran. For hospital admissions, the baseline rates that proposed by WHO were used. a Crude rate per 100,000 inhabitants. b International Classification of Diseases, 9th Revision, Clinical Modification (ICD-9-cm). e 8 h “moving average”. g Chronic obstructive pulmonary disease. Air concentrations of the selected pollutants in the area of interest were measured by Tehran Air Quality Control Corporation (TAQCC), Iran, using 25 permanent monitoring stations (Figure 1). Finally, the air pollutants data from the permanent monitoring station of Tehran city from January 2010 to January 2011 year were used. There are 25 stations for the measurement of air pollution in Tehran, but some of them, based on WHO Criteria for Air Quality Health Impact Assessment, had an invalid data for assessment. Finally, data from 7, 10, 11, 13 and 13 stations located in north, west, south and central parts of Tehran that were consistently active during the study period for, respectively, PM10, SO2, NO2 and O3, were used. For all the pollutants, the parameters required by the software (annual and seasonal maximum and annual 98th percentiles) were obtained and concentrations were recorded to 10 μg/m3 categories, corresponding to equivalent exposure categories. For O3, data were expressed as an 8 h “moving average”; for NO2, as a 1 h average concentrations and for SO2 and PM10 as daily averages. Exposure was estimated considering the city of Tehran as single agglomerate, with a residential population 8,700,000 people. The software assumes that concentrations measured are representative of the average exposure of the people. For example, if on 5% of sampling days concentrations were between 10 and 20 μg/m3, it was assumed that people were exposed to the corresponding concentration for 5% of their time. Table 2 shows the summary of the statistics of environmental data in Tehran. No. Station: number of monitoring stations with valid observations. No. days: number of days with valid observations. The highest PM10 concentration was detected in the summer period with maximum value of 329.95 μg/m3. 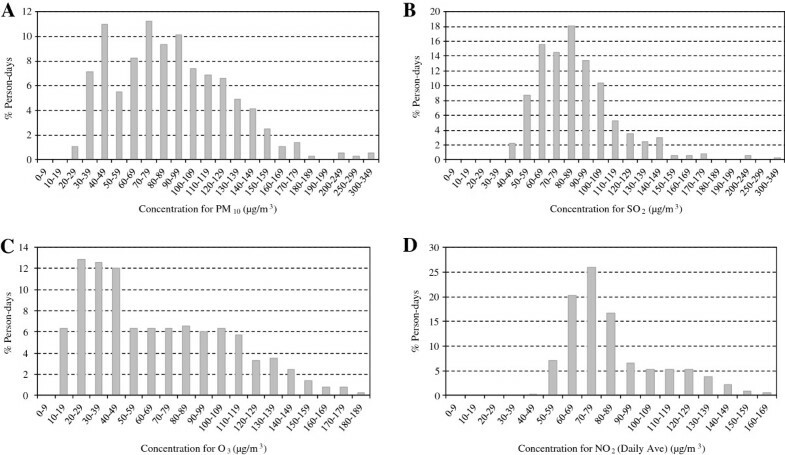 For O3 the maximum 8 h average concentration was 187 μg/m3 detected as expected in summer, while the maximum NO2 and SO2 concentrations, respectively, 163.85 and 313.27 μg/m3 were detected in winter. The obtained results show that annual average of PM10 in Tehran was 1.3 times the world’s average (71 μg/m3)  and 4.5 times the guideline values prescribed by the WHO . Also the annual average of NO2 in Tehran was 2.1 times the guideline value prescribed by the WHO . Figure 2A–D illustrates the concentrations of different pollutants and the percentage of time to which people were exposed to these concentrations. The data were used to estimate the short- term effects. Percentage of days on which people in Tehran are exposed to different concentrations of (A) PM 10 , (B) SO 2 , (C) NO 2 and (D) O 3 . The short-term health impacts of exposure to PM10, SO2, NO2 and O3 above a reference value of 10 μg/m3 are shown in Table 3. The figures represent the estimated AP and number of excess cases in comparison to the cases if concentration values of the pollutants were 10 μg/m3. For O3, the numbers of excess cases over total mortality, cardiovascular and respiratory mortality (Table 3) were based on the RR values from the APHEA-2 project, which investigated health effects of ambient O3 in 23 European cities/areas for at least three years . For NO2 the estimated short-term effects (Table 3) are based on the pooled estimates for the increase in mortality associated with an increase of 10 μg/m3 in 30 European cities participating in the APHEA-2 project . a Obtained using the lower and upper RR values. This paper offers a study case using the WHO approach to assess the impact of atmospheric pollution on human health for people living in Tehran, one of the most populated areas in the world, where the geographical features make the air quality among the worst in the world. The impact was estimated as the increase in all-causes, cardiovascular and respiratory mortality, and hospital admissions for cardiovascular and respiratory diseases, COPD and acute myocardial Infarction for short-term exposure. Considering short-term effects, PM10 had the greatest health impact on the 8,700,000 inhabitants of Tehran city, causing an excess of total mortality of 2,194 out of 47,284 people in a year. The effect of SO2, NO2 and O3 on total mortality was an excess of about, respectively, 1458, 1050 and 819 cases in a year. The AirQ software has been used by other investigators to assess the human health impact of PM2.5[15, 29] or PM10. estimated the human health risk in relation to air quality in two municipalities in an industrialized area of Northern Italy, the authors found that PM2.5 had the highest health impact on the 24,000 inhabitants of the two small towns, causing an excess of total mortality of 8 out of 177 in a year; also Ozone and nitrogen dioxide each caused about three excess cases of total mortality. focused on short-term effects of PM10 in Trieste (about 200,000 inhabitants), a city in north-east Italy; For PM10 concentrations above 20 μg/m3, 52, 28 and 6 cases in excess, respectively, were estimated for total, cardiovascular and respiratory mortality. These figures, if normalized to the population in Tehran (8,700,000 inhabitants), would result in a number of excess cases very similar to those reported for PM10 in Table 2. In another study,  found in Milan (1,308,000 inhabitants), a big industrial city in the Po Valley, the central estimate of the number of excess cases attributable to PM10 was 677 for total mortality. In a study of PM10 and O3 impact on human health in 13 Italian cities, with about nine million inhabitants during the period 2002–2004,  it was reported that on average 8220 deaths a year, excluding accidental causes, were attributable to PM10 above 20 μg/m3. For O3 the effect was estimated at 516 extra deaths yearly. For short-term effects exposure to PM10 above 20 μg/m3 was responsible for 1372 extra deaths. Results obtained from studies of health effects of air pollution in various parts of the world differ. Particulate matter is the pollutant with the biggest health effects in all of these papers, including the present study. This study has several limitations. One of the limitations of this approach is that the health impact focuses on individual compounds without considering the simultaneous exposure to several, which is what actually occurs . The health effects of atmospheric pollution are indeed the consequence of interactions between different air contaminants, and between these and other compounds of natural origin. Generally, in quantitative assessments of health effects, the interactions between different contaminants are not investigated as it would require a good knowledge of the mechanisms of toxicity for the different compounds, which is rarely available. In order to take account of co-exposure to different pollutants, it is often assumed that the health effects of individual compounds are additive. However the simple addition of the effects of the single pollutants would not be right because atmospheric pollutants are usually positively related. A further limitation related to the exposure assessment is that the approach assumes that concentrations measured in specific sampling points are representative of the average exposure suffered from people living in Tehran. Another limitation is due to the RR estimates derived in studies of different populations in comparison to the one under investigation. In particular, while for PM10, SO2, NO2 and O3 the RRs were mainly based on studies on the European population. The transferability of the mortality effect estimates from the evidentiary (e.g., the US cohort) to the target population, however, is feasible if no compelling evidence that the target population and the evidentiary population differ in the response to the air pollution . In conclusion, this study applied the AirQ software and the approach proposed by the WHO to provide quantitative data on the impact of PM10, SO2, NO2 and O3 on the health of people living in a certain area. The results are in line with those of other investigations and, despite the limitations, which are in common to similar studies, indicate that this method offers an effective and easy tool, helpful in decision-making. The magnitude of the health impact estimated for the city of Tehran underscores the need for urgent action to reduce the health burden of air pollution. Local authorities, through policies that aim mainly to reduce emissions from urban transport and energy production, can achieve sizeable health gains. The authors wish to thank Tehran University of Medical Sciences (grant number #11956) and the Institute for Environmental Research (IER) for their financial support for conduct of this study. We also thank Tehran Air Quality Control Corporation for providing us with pollutants concentrations data. KN drafted the parts of the manuscript. MSH carried out the data processing, analysis of data by AirQ software and finalized the manuscript. MY carried out the some of a processing data. FM gathered the some of air quality data,population data and processed the some of data by Excell. RN drafted the parts of the manuscript. SF gathered the some of air quality data,population data and processed the some of data by Excell. AG gathered the some of air quality data,population data and processed the some of data by Excell. All authors read and approved the final manuscript.